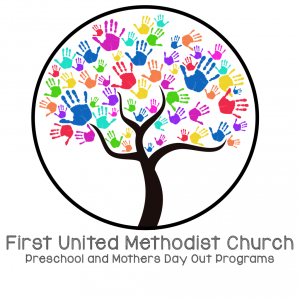 The First United Methodist Church offers a Preschool and Mother's Day Out Program that is truly one of a kind. It has a long history that includes a respected reputation. It exists to provide the community with a Christian environment where young children can learn and grow. Our facility has unique rooms designed for each age group, age-appropriate playgrounds, and is secured for the maximum safety of your child. We also have two adults in each classroom to ensure safety and appropriate student/teacher ratio. For more information on our programs and enrollment forms, please click one of the links below. Enrollment in these programs is offered on a first come, first serve basis. If you have any questions about any of the programs we offer, please call the church office at 255-3353.